Even though India start as firm favourites in the upcoming World Cup, they would have to play consistently well to go all the way in the tournament, feel former cricketers. "The beauty of limited overs cricket is that one just cannot predict the winner. We stand the best chance to win the trophy if we can keep the momentum. We have to be consistent in what is a very long tournament," former India skipper Ajit Wadekar, who led the team to their first ever series victory in England and West Indies in 1971, said. "Ours is a very well-balanced team. We have a good pace attack, good spinners, and most of our batsmen are in good nick. Besides, we have the home advantage. Injuries may play its part but it is a part of the game," he said. Wadekar, who was the coach of the Indian team that reached the World Cup semi-finals when the quadrennial-event was played in the sub-continent in 1996, said India should not become over-confident after registering a couple of wins as they did in the past. "If we start winning we should not get over-confident as it has happened in the past. However, I feel this team is professional and has done well over a period of time. "They are used to playing in pressure situations and have the ability to soak in the tension of playing at home in front of large crowds. We have won many series in India under Mahendra Singh Dhoni in the last couple of years," said Wadekar. On the team composition, the veteran of 37 Test matches and 2113 runs, felt although India's batting line-up is strong, a left-arm spinner instead of an additional off-spinner would have brought a much needed variety in the bowling attack. "We would need a combined effort from our batsmen. 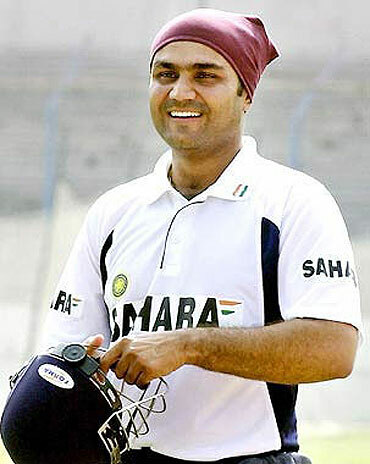 If (Virender) Sehwag gets going, nothing like it. Same applies for (Gautam) Gambhir. Of course, Sachin (Tendulkar) is playing his last World Cup and he would be all geared up. (M S) Dhoni and (Suresh) Raina are capable of playing match-winning innings, while Yusuf Pathan is bubbling with confidence after the knocks he played against South Africa and New Zealand. He can come to the rescue if the top-order fails," said Wadekar. "Zaheer (Khan) will spearhead the bowling and Sreesanth will bring in the aggression. Then there is Harbhajan. But instead of two specialist off-spinners they could have brought in a left-arm spinner by opting (Pragyan) Ojha for R Ashwin. Ashwin is a good bowler but there are too many off-spinners in the side. Sehwag, Raina, and Yusuf can all bowl off-spin. But overall this is a very balanced side," he added. Wadekar said compared to the squad that won the 1983 World Cup, the present bunch looked a better side. "This team looks much better balanced and well-experienced side. In 1983, we were not quite confident. It was that innings by Kapil Dev (175 not out against Zimbabwe at Turnbridge Wells) which turned the things around for us and we went all the way," he added. Recalling the 1996 campaign at home, Wadekar said though India had planned well, a missed catch of Aravinda De Silva during the semi-final match against Sri Lanka cost the team the match. "We had planned it properly. Sri Lanka were always good chasers, reputed for chasing big totals. So it was decided we will not allow them to chase. We started on the right note. Jayasuriya was out very quickly. But dropping Aravinda off a sitter early in his innings was a big mistake. They went on to make a good score, but not very good. Pakistan (in the quarter-finals) but that drop catch proved costly." Wadekar felt while Australia and South Africa could be the other prime contenders in the World Cup other than India, Pakistan could be the dark horse. Meanwhile, former Test cricketer Lalchand Rajput, said though India were the favourites, their real test would start from the quarter-finals. "Everyone is calling India the favourites. The expectations are too high. Although there should be no difficulty in the league matches, the real test will begin from the quarter-final stage since every team that would qualify in the last-eight stage will stand a chance of winning the tournament," he said. Former Test cricketer Bapu Nadkarni also felt that despite India being the favourites, maintaining the consistency could be a problem for the team. "We are going as favourites and I'm not worried about the combination or capability of the team but about the consistency. "We have proved that we are capable of beating the best teams but the tournament is long and I have my doubts," he added.